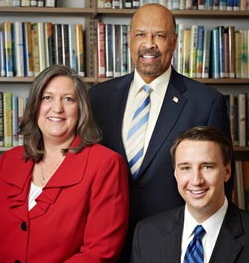 County Commissioners Kathi Cozzone (from left), Terence Farell, and Ryan Costello applaud the county’s selection for a state block-grant program. Chester County was one of 20 counties selected by the Pennsylvania Department of Public Welfare to participate in the Human Services Block Grant program, county officials said today. The Chester County Board of Commissioners was notified Thursday by a letter from Secretary Gary D. Alexander of the Department of Public Welfare, a press release said. The new program is designed to give counties more flexibility in allocating dwindling resources. According to Chester County’s Human Services Director Ruth Kranz-Carl, the designation will also allow the county to keep a maximum of three percent of unspent funds at year-end for the next year. The money can be used to support start-up programs without sufficient initial funding. Commissioner Ryan Costello agreed, pointing out that the county “has an excellent record of managing taxpayer money and being able to maximize services within our budget,” a factor that the state considered in making its selection. Counties were chosen based on geography, size, poverty-level, recent population shifts, their administrative structure and their demonstrated ability to manage the block grant, the release said. The Human Services Block Grant consists of seven funding sources, Mental Health Community Programs, Intellectual Disabilities Community Base, County Child Welfare Special Grants, Homeless Assistance Program, Act 152, Behavioral Health Services Initiative and Human Services Development Fund.